The Expert Advisor of the Forex Fraus family, the system is designed for scalping and adapted for the accounts with fast execution of orders. Features the cold start block. In case of a small balance, the EA automatically manages the number of opened positions relative to the risk management block data, as well as regulates the lot volumes depending on the balance to reduce the risk. After passing the risk-free trading level, the block is automatically disabled. It features a module for sending PUSH-notifications to mobile devices (after every trade it sends a message to mobile devices with the data on the current balance and profit). Very important: the EA does not work together with other Expert Advisors on the same symbol, as the operation algorithm gets interrupted (it may collect data on operation and deals of the other EA). There is a protection by Magic, but do not take any risks. So, make sure there are no Expert Advisors in other windows! Also, make sure your broker allows placing orders at the same time with stop loss and take profit on ECN accounts. If it does now allow this, then it is better to use an account with Market Execution. Optimization note: The default settings are designed for EURUSD M1. If you want to use the robot on other currency pairs, be sure to test in the tester before use. Trading tip: The EA signals do not come often (this can be seen from the tester data). This should not be feared, many people might think that the EA stopped working. However, this is not the case (it can be silent for about a week). Later it is compensated by an order injection once the signal arrives. Therefore, I recommend placing the robot on a virtual server, as the EA is recommended to trade 24/7. SLb - stop-loss for a buy position. SLs - stop-loss for a sell position. send_notifications - sends notifications (false - not allowed to send, true - allowed to send). FilterCatana - prohibit opening positions in the body of the candle, trying to open them nearer to the candle wicks. MAGIC - ID of the EA. Added filter FilterCatana: prohibit opening positions in the body of the candle, trying to open them nearer to the candle wicks. Fixed typo in messages sent by the EA. 1. Added TurboMode to increase the number of signals, true or false. 2. Added the Filter mode to avoid many false signals, does not allow the EA to trade after large price spikes, true or false. 3. Added protection against widening of a floating spread (the EA does not open positions of spread is greater than 20 points). 4. Added AutoSL_AutoTrailSL mode (automatic calculation of stop loss and trailing stop), true ort false. 5. New SLb and SLs parameters allows setting stop loss for buy and sell positions separately (in points). 6. Added manual setting of trailing stop (in points). 7. 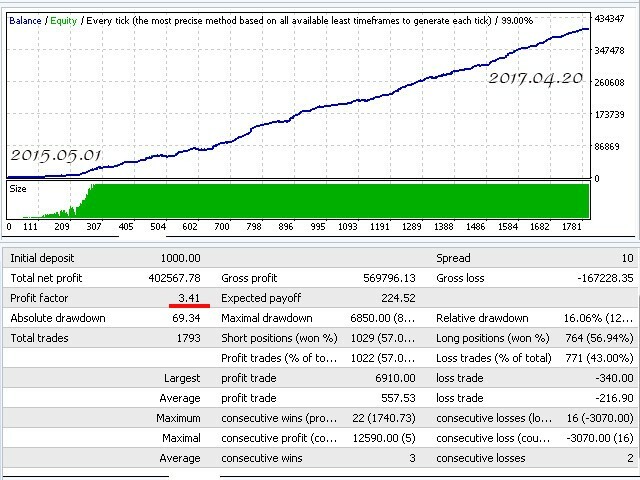 Added OnlyProfitTrail function (trailing only profitable positions, starting from the position open price), true or false, enabled automatically if SLb=0 and SLs=0 . All data and variables in the code have been normalized and brought to the correct values.